This product contains three Large SuperBee Wax Wraps, perfect for sandwiches, salad bowls and watermelon. 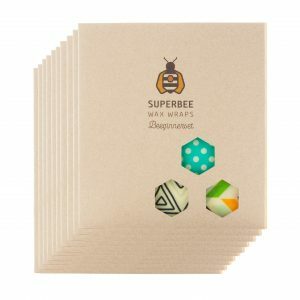 Get the party started with The Large Wax Wrap, whether you are hosting or attending this SuperBee wax wrap is the perfect compliment to your signature dish. The Large Wax Wrap easily covers a salad bowl, serving platter or melon, you can always share your beeswax wrap as a gift for your host. Brighten up your fridge with our beeswax wraps, line shelves with The Large Wax Wraps which are antibacterial and easy to wipe clean of any spillages. Measuring 33 cm x 33 cm, The Large Wax Wraps are reusable, water resistant and antibacterial to cover and protect. They shape to objects and form a tight seal. I like the triple Beeswax Wraps a lot. They are great value. Quality is wunderbar.